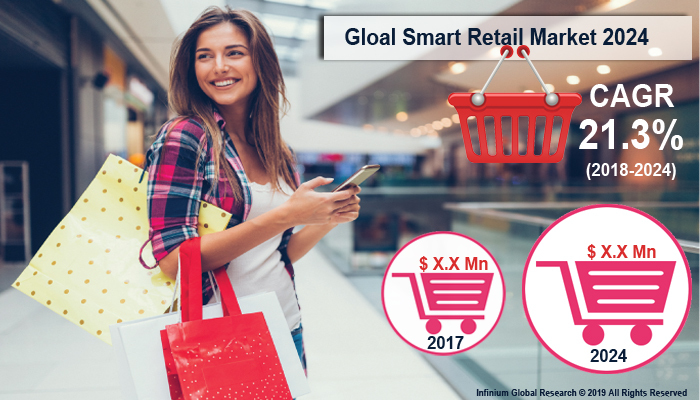 A recent report published by Infinium Global Research on the smart retail market provides an in-depth analysis of segments and sub-segments in the global as well as a regional smart retail market. The study also highlights the impact of drivers, restraints, and macro indicators on the global and regional smart retail market over the short term as well as long term. The report is a comprehensive presentation of trends, forecast and dollar values of the global smart retail market. According to the report, the global smart retail market is projected to grow at a CAGR of 21.3% over the forecast period of 2018-2024. A set of smart technologies designed to give the consumer a faster, greater, safer, and smarter experience while shopping is known as smart retail. Smart retailing provides several advantages to the businesses and enhances the customer experience. It uses RFID's, sensors and consumer devices for data mining, predictive analytics and to optimize operations by responding quickly to customer needs and market trends. The growing adoption of smart devices and technologies in retail businesses owing to increasing demand for improved functionality reduced inventory damage and revenue drives the growth of the smart retail market. Industrial giants such as McDonalds and Walmart has also collaborated with smart retail providers to use the toll-pass system as the means for consumers to pay by voice and improve their shopping experience. The smart retail decreases the implementation costs of technology to improve ROI and sales revenue, provide competitive advantages in businesses, and enhances customer satisfaction and experience. Furthermore, the increasing adoption of IoT and smartphones in retail sectors for store management and increased demand for better customer service presents growth opportunities for the smart retail market. Moreover, the growing use of voice-pay technology and a rapid rise in contactless cards presents profitable opportunities for smart retail providers looking to differentiate and grow. Geographically, North America region holds the dominant share in the global smart retail market and is anticipated to remain dominant over the forecast period. The increasing demand for secure and cost-effective inventory management from the retail sector drives the growth of the smart retail market. In North American countries such as the U.S. and Canada, retailers have adopted smart retailing technologies such as the Internet of things and Big Data Analytics at the retail stores to improve the revenue of business and gain more customers. The Asia Pacific is also anticipated to grow at the fastest rate during the forecast period. The transformative changes in the Asia Pacific retail industries are creating new opportunities for smart retail market players. In addition, the rapidly growing fashion industry and e-commerce favor the growth of the smart retail market in the Asia Pacific region over the forecast period. The report on global smart retail market covers segments such as solution, technology, and application. On the basis of the solution, the sub-markets include software and hardware. On the basis of technology, the sub-markets include NFC, ZigBee, Wi-Fi, RFID, and others. On the basis of application, the sub-markets include foot-traffic monitoring, predictive equipment maintenance, inventory management, GPS tracking, and route optimization, smart fitting rooms, brand protection, loyalty, and others. The report provides profiles of the companies in the market such as LG Display Co., Cisco Systems, Inc., PTC, NXP Semiconductors, Amazon.com, Microsoft, SAMSUNG, NVIDIA Corporation, Robert Bosch GmbH, and Broadcom. The report provides deep insights into the demand forecasts, market trends, and micro and macro indicators. In addition, this report provides insights into the factors that are driving and restraining the growth in this market. Moreover, The IGR-Growth Matrix analysis given in the report brings an insight into the investment areas that existing or new market players can consider. The report provides insights into the market using analytical tools such as Porter's five forces analysis and DRO analysis of the smart retail market. Moreover, the study highlights current market trends and provides forecast from 2018-2024. We also have highlighted future trends in the market that will affect the demand during the forecast period. Moreover, the competitive analysis given in each regional market brings an insight into the market share of the leading players.